#2309 - 8,800 sq. ft. WAREHOUSE ON 10 ACRES OF LAND AT SPANISH LOOKOUT, CAYO DISTRICT. Title : #2309 - 8,800 sq. ft. WAREHOUSE ON 10 ACRES OF LAND AT SPANISH LOOKOUT, CAYO DISTRICT. The warehouse has 18,800 sq. ft. of floor space. There are 4 offices, reception, conference room, bathrooms, and a kitchen and canteen. The office area is tiled and has a/c in each office. The warehouse is split level with the main floor area of 15,680 sq. ft. being use as the office area and workshop and storage area. Above the offices, is an additional storage area of 3,200 sq. ft. and there is a lean-to service area at the rear of the warehouse. The warehouse has a cement construction for the lower level with a steel frame and galvanised zinc for the upper level. 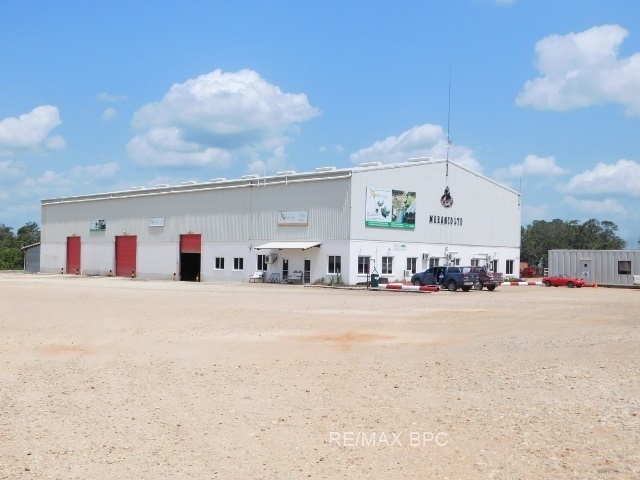 It has ample trade access doors to the workshop and storage areas. The warehouse is sited on 10 acres of land located on the Iguana Creek to Spanish Lookout road and close to the actual Spanish Lookout community border. There is plenty of space on the land for additional businesses, if desired. Spanish lookout is a large Mennonite Community which, while predominantly a farming community, also has many industrial and commercial operations. There are also stores and restaurants, etc. The property has a good, main road access to the George Price (Western) Highway and is approximately 14 miles to the large twin towns of San Ignacio and Santa Elena and about the same distance to Belmopan, the capital of Belize. Contact us at - john@belizepropertycenter.com – for additional photos.